I made a pie safe style cabinet from wood salvaged from my parents farm house destroyed by fire. I used a glass door discarded on the roadside. 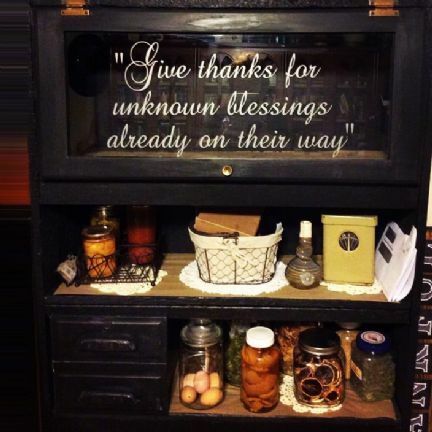 I chalk painted it black and bartered a pear pie with my neighbor for the lettering on the door . Patty, your cabinet is wonderful. You did a great job of making something beautiful out of found things and even bartered for the painted words. 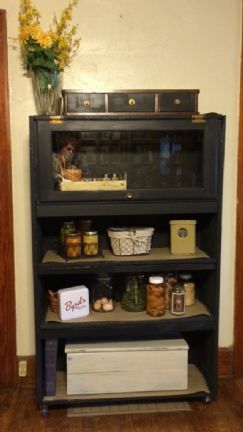 I have a 'thing' for old cabinets; they add so much warmth and personality to any room. Patty, that cabinet is breathtaking, I love it! Great job. I had the bottom of a wrought iron sewing machine and a iron grate. I created an ended table for my living room. I love how it turned out. Kem, I love your end table, it turned out beautiful! The cabinet is just beautiful!!! I love that you salvaged and bartered, how fun! Kem, I love your end table, very cute! When I moved into my little home four years ago my sister gave me 3 pairs of tab linen drapes. She had bought them when she built her new home but didn't use them. Her ceilings are 11' and mine are 7' so when I hung them they puddled. After two years of hanging the bottoms were getting a little dirty, so I cut off 6" from each panel, and washed and ironed it. Put it aside knowing that someday the material would come in handy, and it has. I am using it for merit badges and they look pretty good. One of my favorite items to repurpose is...calendars!!! I get or buy a beautiful calendar each year. After the year is over, I save it 'just in case'. I've collected many calendars over the years and they sure came in handy when decorating our basement. Our basement is unfinished with gray cinder block walls. They seem so drab to me so I cut up my favorite calendars and used them as wall paper! 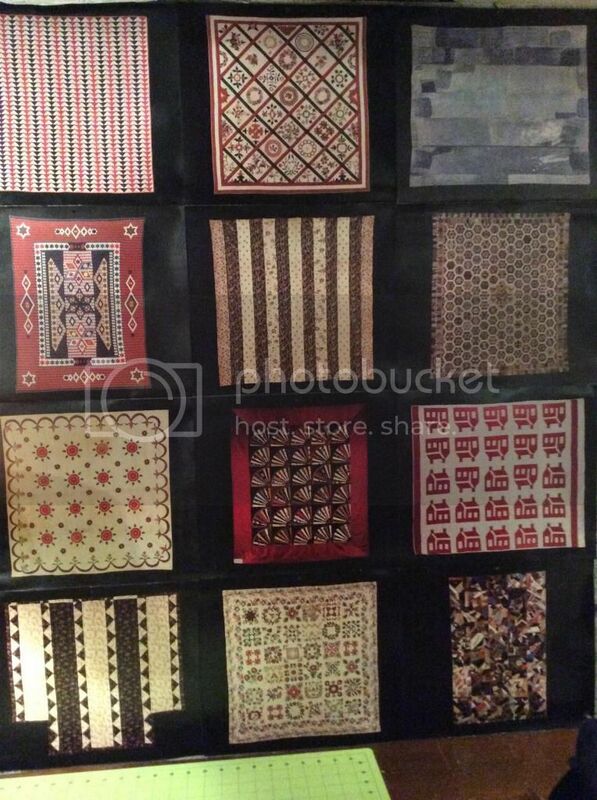 My most recent use was a beautiful calendar of antique quilts. I just 'reclaimed' some space down there to start quilting again, but staring at that gray wall was just too much! So I got my scissors and duct tape and set to work. I love the way it turned out! If I can figure out how to post a picture I will be able to show you all how sweet it works! Hoping this picture made it through...What a process for first time picture posters! If not I will try again. Hopefully, you're looking at my faux calendar wall paper. Ok, its a little big but its there!!! Dena, that is awesome! Luv the idea! Looks really beautiful. Made flower boxes for my little glamper trailer from some of the aluminum pieces I removed from an old camper I tore down. I'm using floral foam and silk flowers because I don't want the weight of potting soil and water and have to deal with trying to keep real flowers alive and blooming. I'll post pics in OUTPOST when they're done! I sprayed these metal scroll plaques white and mounted them in the entry to our house. I also have a metal birdcage and may put that in the corner. Vanessa, those are beautiful! Love that kind of "stuff"! I have one of those Stanley thermos bottles that is silver and green but it no longer keeps anything hot or cold. It has been repurposed with some lace and other bits of decoration into a vase to use with our glamper trailer. It still holds liquid so it can be used for fresh flowers as well as silk flowers. Will be posting a pic in the "Reiver's Rest" thread in Outpost in a couple days! I made myself a CD scarecrow to keep the rabbits away. The vertical is an old broom handle someone left in the yard. It has an eyelet on the end that rotates. I put a stick through it and tied the CDs on it. I taped the stick to the eyelet so it wouldn't slide around. It rotates in the wind and the CDs swing and shine in the sun which startles the rabbits and makes them stay away. I want to put a bit of cement in a hole to keep it straight. Marie, brilliant.You have bought the scarecrow into the 21st century. Here's a pic of the Stanley thermos bottle I mentioned a few posts ago. The flowers are silk, but I could put real ones in it! Everyone has such neat ideas here. I have a sort of blindness when it comes to "seeing" how to use something again. Honestly, the ideas just don't come to me very easily. I am thinking this Farmgirl is missing a gene or two in the repurposing department!!LOL!! But I do excel at copying someone else's ideas!! Hehehe! you ladies are uber awesome! I currently am working on converting an old wooden sewing desk w/drawers into a port-a-ble bar,,, it was free and I talked hubby into helping... now all I need to do is paint it, polish up the handles, cut a hole in it for the basin and volia! I'll will post pics when it is done.